Overall, the body's immune response has one primary function: to protect the body from an object that the body does not recognize as a normal object. The immune response can be either normal or abnormal. Inflammation is also one of the body's first responses to infections as the body tries to rush immune cells and cytotoxic chemicals to the infected tissue to defend against the infections or foreign particles. Arthritis tends to develop inflammation in the joints and their surrounding tissues. Rheumatoid arthritis is an autoimmune disease where the body perceives tissue in the joints as being a foreign object and fights the tissue through an immune response. Tests for rheumatoid arthritis are rather simple and readily available. Rheumatoid arthritis has many options available for treatment such as medications and minor surgeries. Future advancements are continually being tested in clinical settings to help in improving treatment for rheumatoid arthritis patients. Immunity, Inflammation, and Rheumatoid Arthritis. Harper, Erica . Lethbridge Undergraduate Research Journal. Volume 2 Number 1. 2007. Have you ever experienced a bee sting? Although it is not a pleasant feeling, it initiates an immune response which the body does naturally everyday to protect itself from foreign objects or invaders. Overall, the body's immune response has one primary function: to protect the body from an object that the body does not recognize as a normal object (1). The purpose of this review article is to give the reader a better understanding of how the body works under normal circumstances and abnormal circumstances that in turn affect the creation of rheumatoid arthritis. It is not enough to address rheumatoid arthritis as a single item because so many other factors play a role in its development and continuation. This review article addresses every aspect involved in rheumatoid arthritis starting with the immune response and ending with a detailed section on rheumatoid arthritis. The immune response is put into action by the immune system of the body. The immune system protects the body from foreign objects that can possibly be damaging to the health of the body. The immune system is a group of specific cells and organs that work together to maintain homeostasis in the body and defend the body against harmful objects that can do severe damage if not removed or eliminated (2). The immune system is the best “weapon” that the body has to fight off things that can affect the body's chances of survival. Although the immune system is something the body has naturally, the immunities that it acquires are obtained differently (1). Acquired immunities and the passive immunities are the two different types of immunities that the body can achieve. Acquired immunities are those which the body develops on its own when exposed to a specific antigen. When exposed to a foreign antigen, the body reacts by producing an antibody against this particular antigen. Acquired immunities are continuously developing over time because the body is constantly faced with antigens from different environments and people. Also, the acquired immunities are more of a permanent state than the passive immunities because they are developed by the body itself. With acquired immunities, the body maintains a memory of that specific antigen and the defense taken against that antigen to eliminate or remove it so that it is no longer a threat. The other type of immunity is called the passive immunities. Passive immunities are developed or produced in someone else's body. For example, when a woman is pregnant she will pass her immunities that her body has made to the baby. Unfortunately, these immunities are not permanent like the acquired immunities (1). The immune system has many components. The most easily seen component of the immune system is a person's skin. The skin forms a physical barrier that acts as a first line of defense for the body. The skin prevents most pathogens or antigens from entering the body because of its composition of numerous layers of tissue which creates a tough surface for the antigens or pathogens to penetrate. Another component of the immune system is a “chemical barrier” formed by the mucosal linings in the intestines and esophagus and the acidic fluid of the stomach. These chemical defenses help to destroy foreign substances such as antigens or pathogens. The last stage of the immune system's line of defense is the blood itself. A person's blood is made up of many microscopic components that help to sustain homeostasis for the body and prevent possible infectious material from reproducing and causing the body harm. One key component of the blood is the lymphocytes or white blood cells. Lymphocytes can be subdivided into B-lymphocytes and T-lymphocytes. These cells are sometimes also referred to as B-cells and T-cells respectively. The B-lymphocytes produce antibodies or immunoglobulins that fight off the foreign object or antigen. There are several categories of T-lymphocytes that have different job assignments in the immune response (1). First, there are the cytotoxic T-cells that use T-cell receptors to recognize a foreign object or antigen. These T-cells then release granzymes, exogenous serine proteases, which in turn cause that particular cell to perform a task known as “cell suicide”. When that “cell suicide” cycle is complete, both the cell and any antigen or pathogen within it dies and is eliminated. There is also helper T-cells. Helper T-cells trigger macrophages and generate interleukins which stimulate production of both B-lymphocytes and T-lymphocytes. Lastly, there are regulatory T–cells. These regulatory T-cells help to regulate, as the name implies, the cell-mediated immunity (2). The blood is also made up of different proteins that are involved in the immune response. The complement system contains serum proteins that are activated by three different pathways. The activation of these various pathways can cause an abundance of protein activity that can lead to various effects such as destroying the pathogen by antigen-antibody complex or even inflammation. Interferon is another protein involved in the body's immune response. Interferon acts as an anti-microbial protein and is given off by an infected cell. Interferon helps to reduce the antigen replication in neighboring cells. Another element of the blood defense is the phagocytic cells. The macrophages are one such phagocytic cell. Macrophages, which are activated by the helper T-cells, actually swallow up the foreign substances and destroy the antigens in the blood. Interestingly, neutrophil granulocytes also perform similar phagocytic functions in the blood (2). When an immune response is activated, all of these individual components are coordinated into a common effort. This type of an immune response can be initiated by several foreign things. For instance, viruses, such as the infamous flu, can initiate an immune response. Bacteria from something that was touched and then enters the body can also initiate an immune response. Furthermore, the body can also respond defensively to drugs, fungi, toxins, and other various foreign particles (1,2). Thus far this paper has discussed the normal immune responses of the body. Unfortunately, abnormal immune responses can occur in the human body. These abnormal immune system responses can be termed hypersensitivity reactions. Hypersensitivity reactions can be broken down into four types. First, there is the type I hypersensitivity reactions. These are the anaphylactic type reactions. This type of reaction is cause by the B–lymphocytes. These B-lymphocytes are sensitized to certain antigens, such as pollen, when they are exposed to the antigen initially. These B-lymphocytes normally create antibodies to the antigens in the area exposed which eventually spread to surrounding mast cells and are secured to the mast cells receptors. Unfortunately, when the body is re-exposed to the antigen, the antigen-antibody complexes form quickly on the surface of these mast cells. These mast cells then cause vasoactive substances that are stored in their granules to be release. The most problematic of these vasoactive substances is histamine. This overall reaction generates a “late-phase response” which takes approximately four to six hours to be completed following the exposure to the antigen. Hay fever/allergic rhinitis, atopic dermatitis, asthma, and anaphylactic shock are all examples of type 1 hypersensitivity reactions (3). Hay fever, or allergic rhinitis, occurs when the body is exposed to a specific allergen that can be inhaled. This type of hypersensitivity is usually seasonal in nature. The inhaling of the allergen or pollen causes nasal itching, sneezing, swelling of the nasal mucosa, and inflammation of the conjunctiva (i.e. conjunctivitis). Atopic dermatitis is another type 1 hypersensitivity reaction. This type of reaction occurs mainly in the early years of life and manifests itself as a chronic skin irritation or eczema. A third example of a type I hypersensitivity reaction is asthma. Asthma can also be broken down into several types but is mainly caused by inhaled allergens that affect the bronchi in the lungs. This type of irritation to the bronchi in the longs leads to coughing and wheezing symptoms associated with asthma. The last example is anaphylactic shock. This type of hypersensitivity reaction can be fatal because the whole body encounters the antigen that it already has sensitivity to. For instance, anaphylactic reactions can cause choking, wheezing, shortness of breath, swelling around the lung area (i.e. pulmonary edema), and lead to eventual circulatory collapse. The severity of anaphylactic reactions is directly related to the number of organs being affected by this type of hypersensitivity reaction (3). The next type of hypersensitivity reactions is the type II reaction or cytoxic antibody reaction. This reaction occurs when the cytoxic antibodies respond to antigens that are inside cells. The antigen may be intrinsic or extrinsic. And, as with type I reactions, the antigen-antibody complexes are again formed. These complexes initiate complement proteins which affects the event of cell lysis. An example of such a reaction is when an individual receives a mismatched blood transfusion. Another example is hemolytic anemia which can occur in numerous forms. This type or hypersensitivity reaction is also responsible for the various disorders in which the body recognizes some of its normal tissues as being a foreign object or invader. This results in the body beginning to “fight” itself. This type of hypersensitivity reaction and disorder is sometimes referred to as an autoimmune disease. As discussed later in this paper, Rheumatoid Arthritis is thought to be this type of autoimmune disease in which the body starts attacking it own joint tissues (3). The third type of hypersensitivity reactions is the type III or immuno-complex reaction. This type of reaction occurs as a result of complexes being formed between the antigens and antibodies. These complexes start out few in number but increase in quantity over time. Eventually, when these complexes increase in number they can generate adverse immunological reactions to otherwise ‘normal' tissues. An example of such a type III hypersensitivity reaction is systemic lupus erythematosus (SLE). Lupus is an autoimmune disease with the underlying cause still unknown. Its symptoms include arthritis, certain skin diseases, renal and kidney diseases. Another example of a type III hypersensitivity reaction is post streptococcal glomerulonephritis which is an acute renal disease found in some individuals following infection by some strains of streptococci. The last example of a type III reaction is polyarteritis nodosa. This disease manifests itself as a generalized inflammatory disease of the small to medium size arteries of the body. The overall symptoms of this disease involve acute inflammation of the vessels and focal fibrinoid necrosis (3). The last and final type of altered immune responses or hypersensitivity reactions is the type IV or cell-mediated/delayed type immune reactions. This type of hypersensitivity reaction involved the T-lymphocytes and macrophages and is initiated when a complex of antigens is engulfed by the macrophages. The antigen is then examined by the T-lymphocytes and an immunological “memory” of the antigen is formed. Under normal conditions, this is valuable to the body for a repeated exposure to the antigen. However, sometimes this type of immunological memory functions abnormally and overreacts to the repeated antigen exposure. Contact dermatitis is the most prevalent example of a type IV hypersensitivity reaction. Interestingly, contact dermatitis can be caused by many different allergens or allergies and it usually associated with symptoms of increased vascular permeability and wheal formation (3). Each of these types of hypersensitivity reactions contains their own unique characteristics. Overall, these hypersensitivities are just altered immune responses where the body responds abnormally to the antigen or pathogen because of a previously developed sensitivity initiated by an initial exposure. Normally, the body's immune response is ever-present and will continually fight off objects that the body does not recognize. Unfortunately, in some cases the body's immune system will continually attack normal parts of it and cause unnecessary damage. Interestingly, part of the body's way of dealing with this damage is similar to the way it tries to attack foreign substances through an immunological response. This commonality is the body's initiation of an inflammatory response. Inflammation is a complex process that varies in its ability to be either beneficial or damaging to the body. Inflammation can be a response to gross tissue damage induced by some form of trauma. Inflammation is also one of the body's first responses to infections as the body tries to rush immune cells and cytotoxic chemicals to the infected tissue to defend against the infections or foreign particles. These types of inflammation are beneficial to the body because it aides in destroying the pathogen and also helps in the healing process. Inflammation can also be triggered by the body in an area where there is no threat or foreign invader (4). These are the previously discussed autoimmune diseases in which the body perceives its own tissues as being foreign. These autoimmune diseases are an example of inflammation that is very damaging to the body. There are a variety of symptoms associated with inflammation and the severity of these symptoms depends on the intensity of the inflammation. For example, a person may experience fatigue or a feeling of being tired. They can experience a low-grade fever, chills and minor headaches. Redness and swelling of the inflamed tissue is also commonly reported and is cause by the excess fluid that infiltrates the effected tissues. If muscle or joint tissue is inflamed, muscle and joint stiffness can also be experienced. Overall, the extent and specific types of symptoms will be dependent on the individual, the amount of inflammation involved, and the area that it is involved in (4). The causes of inflammation vary according to the person's immune system. One cause of inflammation is the environment in which the person lives and the changes that occur within that environment such as pollution in the air and cold versus hot climates. Certain foods have also been shown to cause inflammatory responses in individuals that are allergic to those foods. These food allergies will elicit the same types of hypersensitivity reaction discussed previously. These hypersensitivity reactions will be associated with an inflammatory response as the immune response tries to defend the body from the ‘foreign' materials. Stress also attributes to the amount and prevalence of inflammation in some individuals. Finally, any immunological response in which there are foreign invaders will cause the defending leukocytes to release specific chemicals that increase the blood flow to the infected area. This increased blood flow to the infected tissues will result in the same type of tissue inflammation as is seen when the tissue is actually injured by trauma (4). Even though inflammation can be hard to control once it is activated, there are items within the body that have the responsibility of regulating the amount of inflammation and its intensity. These items are called regulators and consist mainly of cytokines and prostaglandins. The cytokines activate other cells which initiate an inflammatory response, and the prostaglandins lead in the production of other cells that aide inflammation (5,6). Many treatments are available to help with the inflammation or swelling. One type of treatment is through the administration of medications such as non-steroidal anti-inflammatory drugs like aspirin or corticosteroids like prednisone. Also, exercise is another type of treatment that is beneficial to the controlling of the inflammation. Rest and elevation of the affected area can also contribute to inflammation decreasing which in turn will alleviate some of the pain or other symptoms that can be brought on by inflammation (4). In summary, inflammation has its positive and negative attributes when protecting the body against foreign invaders or pathogens. Inflammation has numerous factors that can initiate the inflammatory processes. Normally, these processes are vital to the body's immune responses to foreign substances. Inflammation is usually one of the key signals that an action is occurring in the body that needs to be addressed (4). However, these inflammatory processes can be very damaging when initiated and controlled improperly. Autoimmune diseases are a perfect example in which the body perceives itself as the enemy and initiates an abnormal immunological and inflammatory response. Arthritis is a disease that tends to go hand-in-hand with joint inflammation. Arthritis tends to develop inflammation in the joints and their surrounding tissues (4). Arthritis, like other diseases of the body, can be subdivided into the three main types that affect many people today such as osteoarthritis, infectious arthritis, and rheumatoid arthritis (7). Rheumatoid arthritis is an autoimmune disease where the body perceives tissue in the joints as being a foreign object and fights the tissue through an immune response (17, 19). This immunological response causes chronic inflammation of the joints and surrounding tissues (12,13, 19). During this process the body breaks down its ‘normal' joint tissues and replaces it with non functional scar tissue (13). All of these processes lead to uncontrollable chronic inflammation of the affected joints. For instance, symptoms associated with rheumatoid arthritis are early morning stiffness of the joints, loss of appetite, low-grade fever (also a side-effect of inflammation), limited range of motion due to loss of joint mobility, deformities of the hands and feet from the swelling and deterioration of tissues and bone, nodules under the skin, and pain and redness in the joints from chronic inflammation (12). Overall, most of these symptoms of rheumatoid arthritis are a direct result of the chronic inflammation in the effected joints (10). Unfortunately, there is no proven cause of rheumatoid arthritis (12, 17). However, there are some potential factors that are thought to contribute to the development of rheumatoid arthritis in some individuals. For instance, there seems to be a heredity factor suspected with rheumatoid arthritis (12, 16,17). An overactive immune response is also thought to cause the body to become too eager in fighting foreign invaders to the point where the body itself becomes the enemy (8,9,10). Some even think that certain infectious materials can trigger this type of arthritis (12, 17). Hormonal interactions may also contribute to the development of rheumatoid arthritis as females are two times more likely to develop rheumatoid arthritis than men (16,17). Overall, in the United States, rheumatoid arthritis affects over two million people nationwide (9). Like many other diseases, rheumatoid arthritis has the best outcome when it is detected in the early stages (15, 17, 19). Tests for rheumatoid arthritis are rather simple and readily available. They can range from a general radiographs, detailed magnetic resonance image (MRI's) or a simple blood exams (9,10). The general radiographs and MRI tests, which are used to monitor disease progression, have very similar advantages and disadvantages (17). For instance, some advantages of the radiographs and MRI's used in diagnosing rheumatoid arthritis are that the evidence of rheumatoid arthritis can be easily detected such as swelling and degree of joint damage in the joints involved in the disease (13). The disadvantages are that the general radiographs and MRI's can only show evidence of rheumatoid arthritis when the disease has already progressed to a fairly advanced stage (8). For instance, these imaging modalities will only show bony erosions, calcifications, narrowed joint space, swollen joint capsules, and loss of cartilage and bone that are associated with the advanced stages of rheumatoid arthritis (11). However, MRI has advanced tremendously within the past few years and is proving to be a vital asset in diagnosing and monitoring rheumatoid arthritis. For example, MRI is surpassing general x-ray because it now has the capability to demonstrate evidence of rheumatoid arthritis at very early stages from disease onset (18,19, 21). Examples of these types of images can be seen in Figures 1A, 1B, and 2A. Also, clinical studies have shown that at baseline MRI detected evidence of rheumatoid arthritis in 45% of the patients, whereas general x-ray only detected evidence in 15% of the patients (11). 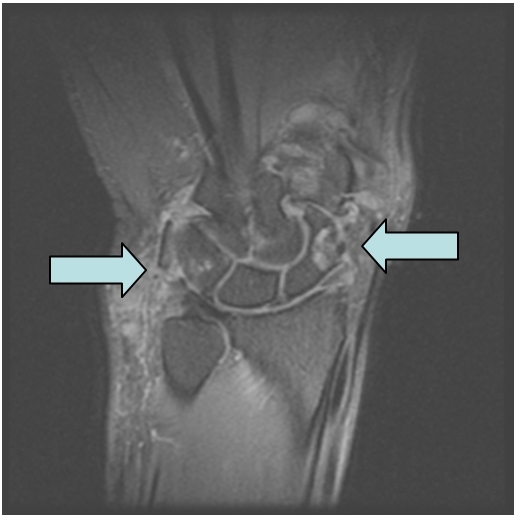 Consequently, MRI is steadily becoming the most widely used modality in diagnosing and monitoring rheumatoid arthritis because of its ability to show erosions, calcifications, synovitis, and other evidence of rheumatoid arthritis at earlier stages than other imaging modalities and with a greater sensitivity (11, 14, 17). 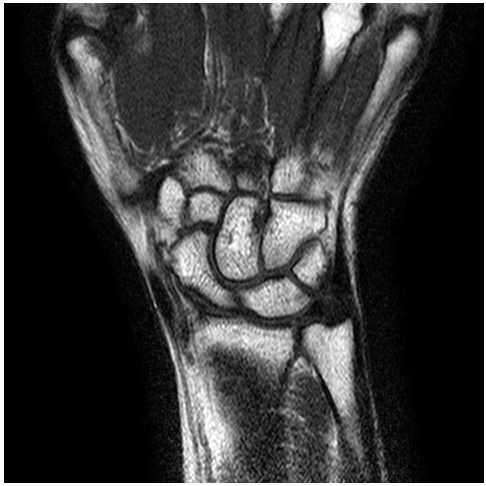 Figure 1a: Demonstrates an MR image of a normal wrist. 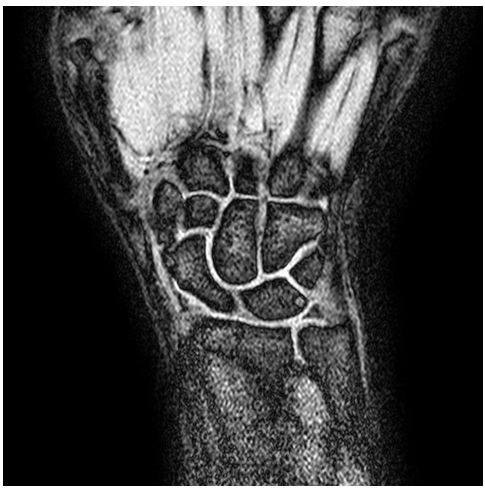 Figure 1b: Demonstrates an MR image of a wrist with rheumatoid arthritis. The arrows point to the RA. 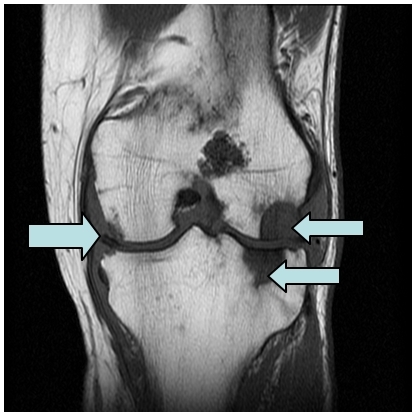 Figure 2a: Demonstrates an MR image of a knee with rheumatoid arthritis. The arrows point to the RA. There are also blood tests being used to examine for a “rheumatoid factor” (12, 16, 19). This factor is found in eighty percent of people with rheumatoid arthritis (9). Furthermore, erythrocyte sedimentation from a blood sample will be elevated when rheumatoid arthritis is present (12, 16). The blood exams can also look at the complete blood count and determine if it has a low hematocrit or C - reactive proteins, each being abnormal in individuals with rheumatoid arthritis (12, 16). Rheumatoid arthritis has many options available for treatment such as medications and minor surgeries (16). Physical therapy, exercise, and rest are also valuable ways to treat rheumatoid arthritis (16). Current medications can be disease-modifying anti-rheumatic drugs such as methotrexate (rheumatrex), leflunomide (arava), adalimumab (humira), or etanercept (enbrel) (13). Non-steroidal anti-inflammatory drugs such as ibuprofen as well as cyclooxygenase-2 inhibitors like celebrex have are also helpful in treating the symptoms of rheumatoid arthritis. Immunomodulators and glucocorticoids are also medications that can aide in rheumatoid arthritis treatment (8). Surgeries are also sometimes needed to not only treat but also help detect the advancement of rheumatoid arthritis. For instance, a sysnovectomy in which the synovial fluid is pulled out of the joint capsule can ease some of the pain associated with the chronic joint inflammation (10). In the late stages of the disease, joint replacement surgery may be the only option to alleviate the pain associated with the rheumatoid arthritis (10). Fortunately, research and new treatment options are being discovered constantly in the area of rheumatoid arthritis. On such promising treatment option is radiation therapy. Radiation therapy has been shown to wipe out a persons defective beta cells and thereby initiating a “remission” in a person's abnormal autoimmune response to their joint tissue. All of the information on the immune response and its subdivisions, inflammation and arthritis, detailing rheumatoid arthritis, is incorporated together by the natural functions of the body. Without the immune system initiating the immune response to protect the body from a foreign object, then there would not be any altered immune responses, autoimmune diseases, or inflammation from diseases such as arthritis because nothing would trigger the immune system to fight and protect the body; therefore, the body would have no defense mechanism to shield it from potentially destructive things (1,2). Unfortunately, inflammation is a part of the immune response that can be damaging to the body while trying to aide in its recovery (4). Inflammation performs damaging effects in the immune response to arthritis especially rheumatoid arthritis. With rheumatoid arthritis the immune response is altered because it is an autoimmune disease where the body is fighting itself and inflammation is destructive in this case because it is uncontrollable (18). The uncontrollable inflammation leads to various symptoms being manifested but there are many treatments available to help with every symptom of rheumatoid arthritis. Also, there are new treatments evolving for rheumatoid arthritis, various autoimmune diseases, and hypersensitivity reactions or altered immune responses that demonstrate a hopeful and bright future waiting for all people who suffer with one of these conditions. I am currently an undergraduate senior student at the University of Alabama at Birmingham. I am in the Radiography Program and will be graduating at the end of the year 2006. I have been working on this research project for the past year and a half with my mentor Dr. Bradley Newcomer. I would like to thank Dr. Newcomer for all of the hard work and many hours he has put into this project. Without Dr. Newcomer's professional guidance and teaching this project would not have been possible. 1. Medline Plus Medical Encyclopedia. The Immune Response page. Available at: http://www.nlm.nih.gov/medlineplus/ency/article/000821.htm. Accessed April 13, 2006. 2. Wikipedia, the free encyclopedia. The Immune System page. Available at: http://en.wikipedia.org/wiki/Immune_system. Accessed April 13, 2006. 3. Damjanov I. Immunopathology. Pathology for the Health Professions. St. Louis, MS: Elsevier; 2006: 50-55. 4. The Cleveland Clinic Health Information Center. The Inflammation page. Available at: http://www.clevelandclinic.org/health/health-info/docs/0200/0217.asp?index-4857. Accessed April 4, 2006. 5. Inflammation. The Inflammation page. Available at: http://users.ren.com/jkimball.ma.ultranet/BiologyPages/I/Inflammation.html Accessed April 4, 2006. 6. The Inflammatory Response. The Inflammation page. Available at: http://alan.kennedy.name/crohns/primer/inflresp.htm. Accessed April 4, 2006. 7. Damjanov I. Bones and Joints. Pathology for the Health Professions. St. Louis, MS: Elsevier; 2006: 446-452. 8. eMedicine. The Rheumatoid Arthritis page. Available at: http://www.emedicine.com/emerg/topic48.htm. Accessed April 13, 2006. 9. Arthritis Foundation. The Rheumatoid Arthritis Fact Sheet page. Available at: http://www.Arthritis.org/conditions/Fact_Sheets/RA_Fact_Sheet.asp . Accessed April 13, 2006. 10. Medline Plus Medical Encyclopedia. The Rheumatoid Arthritis page. Available at: http://www.nlm.nih.gov/medlineplus/ency/article/000431.htm. Accessed April 13, 2006. 11. Cohen S, DEodhar A, Kavannaugh A, et al. 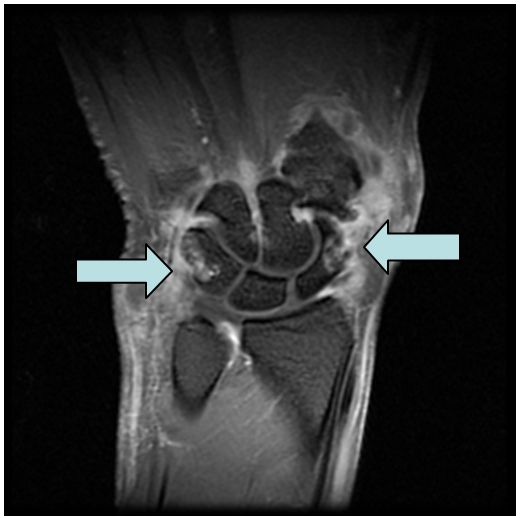 Extremity Magnetic Resonance Imaging in Rheumatoid Arthritis. Arthritis & Rheumatism. 2006; 54: 1034- 1047. 12. Burton S, Lloyd M. An Overview of Rheumatoid Arthritis. Nursing Standard. 2006; 20:46-49. 13. Savage C, Clair E. New Therapeutics in Rheumatoid Arthritis. Rheumatic Disease Clinics of North America. 2006; 32: 57-74. 14. Conaghan P, McQueen F, Peterfy C, et al. The Evidence for Magnetic Resonance Imaging as an Outcome Measure in Proof-of-Concept Rheumatoid Arthritis Studies. The Journal of Rheumatology. 2005; 32: 2465-2469. 15. 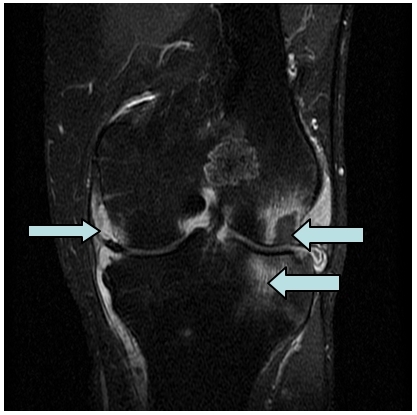 Keen H, Brown A, Wakefield R, Conaghan P. MRI and Musculoskeletal Ultrasonography as Diagnostic Tools in Early Arthritis. Rheumatic Disease Clinics of North America. 2005; 31: 699-714. 16. Rindfleisch J, Muller D. Diagnosis and Management of Rheumatoid Arthritis. American Family Physician. 2005; 72: 1037-1047. 17. Sommer O, Kladosek A, Weiler V, Czembirek H, Boeck M, Stiskal M. Rheumatoid Arthritis: A Practical Guide to State-of-the-Art Imaging, Image Interpretation and Clinical Implications. Radiographics. 2005; 25: 381-398. 18. Ostergaard M, Ejbjerg B, Szkudlarek M. Imaging in Early Rheumatoid Arthritis: Roles of Magnetic Resonance Imaging, Ultrasonography, Conventional Radiography and Computed Tomography. Best Practice & Research Clinical Rheumatology. 2005; 19: 55-72. 19. Visser H. Early Diagnosis of Rheumatoid Arthritis. Best Practice & Research Clinical Rheumatology. 2005; 19: 55-72. 20. 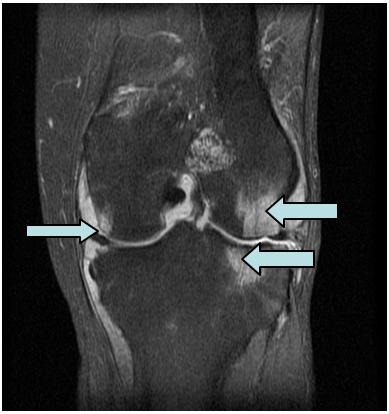 Evangelisto A, Wakefield R, Emery P. Imaging in Early Arthritis. Best Practice & Research Clinical Rheumatology. 2004; 18: 927-943. 21. Ostergaard M, Duer A, Moller U, Ejbjerg B. Magnetic Resonance Imaging of Peripheral Joints in Rheumatic Diseases. Best Practice & Research Clinical Rheumatology. 2004; 18: 861-879.